I come from a chiropractic family. My mom has been getting adjusted all of her life. My pop-pop believed in chiropractors + swore by an applied kinesiology doctor. My dad had a bad low back, walking like a duck at times due to an inflamed lumbar disc issue. He also swore by the chiropractor who practiced out of his home + had the office that smelled like fresh leather, no matter when we entered his office. As of this writing, my mom is 55 years old. (Only to have it tighten up again by the next day. The temporary relief is called a “Reflexive Change” – this is a neurological phenomenon, not a pathology-reducing phenomenon). As I’ve gotten better at finding + removing adhesion, I’ve become able to perceive where I can or cannot help an individual. Mom, I can’t help your neck. You’re too far gone. What? What do you mean? I’ve been getting adjusted all of my life. How is this possible? The neck tension + pain you’ve had all of your life was caused by something. And the pathology wasn’t an “adjustment deficiency”. At this time, your degeneration has progressed so much that while you do have adhesion, it’s irrelevant to the pain you’re experiencing. Going forward, stop being such a stressball. Remember to breathe. Enjoy life. Don’t sit so much. In fact, buy a standing desk. And yes, when I visit, I should still remove the adhesion to prevent further degeneration of your spine to the extent I can find any tissue that pulls tight. In our office, the patients who respond quickly + get better with 100% permanent resolution look like the 1st graph below. 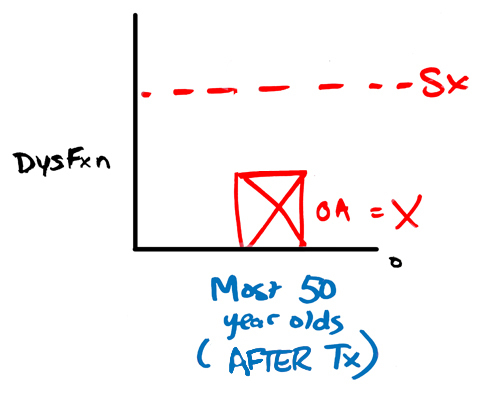 The Y axis shows “Dysfxn”. Dysfunction is a biomechanical term for a Problem. 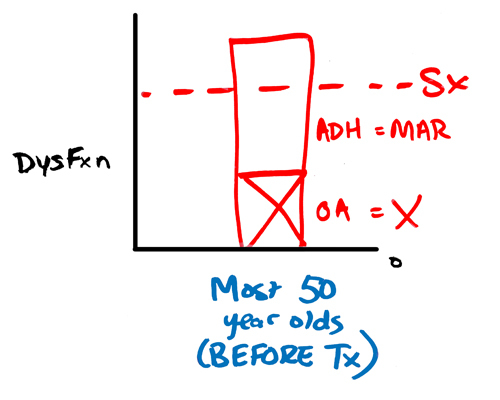 “Sx” indicates Symptom threshold. Because the block is above the dotted line, this person has pain. In an ideal world, every person with have no blocks on the graph indicating perfect health + huge capacity to do what one loves to do in life. The below example has one problem – adhesion. The sweet spot solution for adhesion is Manual Adhesion Release. The below graph is a typical 50 year-old person. She has two issues. One is “OA” or osteoarthritis. There is no direct treatment for this condition. OA can only be prevented from growing in magnitude and the pain can be managed, not resolved. Treatment to remove the adhesion would bring this patient well below the symptom threshold + give this person a lot of room to do things with her body. The below graph is my 57 year-old mom. Her OA has grown bigger in size relative to the adhesion. Because the “OA” block is above the symptom threshold by herself, no amount of alternative treatment will bring her pain level to an acceptable level. 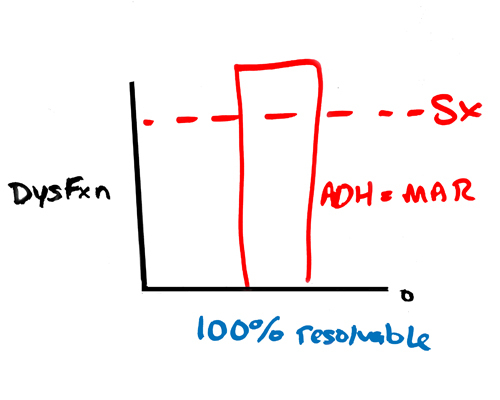 NOTE: This graph is oversimplified. My mom does have other dysfunction blocks (stress, excessive load with sitting, poor sitting posture, emotional stress). 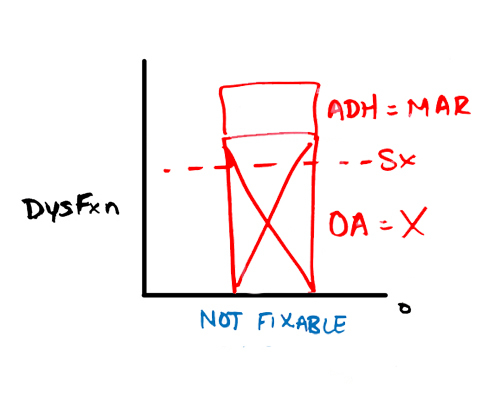 I draw it this way to prove the concept of structural dysfunction (aka block with “X” through it). The graphs indicate the reality of a person’s condition. Unfortunately, it’s not what I was taught in school. She waited to hear the answer from the class. She looked around the room. She overheard a student say “everyone” and she smiled again. I’m sorry, but I respectfully disagree. Most Straight Chiropractic philosophy says adjusting spinal joints is like unkinking the water hose of the nervous system. They claim the nervous system is the master system and controls every piece of the body. Without a kink in the hose, the water can flow. The nervous system can send impulses + fix/heal anything that is damaged. If that were working, then why do other forms of healthcare exist? But traditional chiropractic does work for one pathology. What pathology is chiropractic the gold standard treatment for? When you have a meniscoid entrapment, a chiropractic adjustment is the #1, sweet-spot treatment for it. Typically, this occurs in an individual who has never experienced a spine or disc issue before. He was probably moving funny + when he came back to his normal, neutral position, he felt something catch. That was the meniscoid becoming stuck in between the facet joints – either in the neck or in the low back. The chiropractic adjustment is a quick force that gaps the facet joints, creating space so the meniscoid can be freed. Normally, this takes one adjustment in one treatment visit + it never occurs again. Some might call this a “chiropractic miracle”. When there is no meniscoid entrapment, what might traditional chiropractic adjustments be doing to the body? This is a good time to share that I’m not against lifelong care. I believe that chiropractic adjustments, physical therapy, massage, acupuncture, or adhesion removal do have a place in one’s healthcare regime. What I’m against is any form of care that ignores (+ avoids) more significant problems, allowing those problems to get bigger. Getting chiropractic adjustments without addressing structural dysfunctions (cartilage, bony, + disc problems) or adhesion can let what happened to my mom happen to you. You’ll experience temporary relief, only to need to go back for that temporary relief for as long as you’re alive. 1. The actual problem is able to grow + get bigger (on its own). Because you think you’re addressing the cause of the issue by getting the pain adjusted. After all, you walk into your chiropractic office with pain + you walk out with less (or no) pain. But really, you’re minimizing symptoms while the under-the-radar fire spreads + wreaks havoc. 2. The adjustment contributes to help the actual problem grow + get bigger, like adding gasoline to a fire. Imagine a disc injury with resulting muscle spasm. If you’re like most Americans, you get a spasm – only to rush to your primary doctor to get muscle relaxers. What you don’t realize is that the muscle spasm is a protective response from your nervous system indicating your body has such severe damage that it’s shutting you down from any increased risk of adding load (in the form of movement) to your damaged area. So it locks you up. And you have an acute jolt of pain during the adjustment with immediate relief afterwards. Wow. I really needed that. What isn’t being told to you is that your disc didn’t want any more movement or stress at this time. In fact, your disc wanted to not move. What do you think happens to a bulging or herniated disc that receives a quick, forceful, rotational force into it? Especially when inflamed? The answer is that it becomes really unhappy. If not in the short term, definitely in the long term. 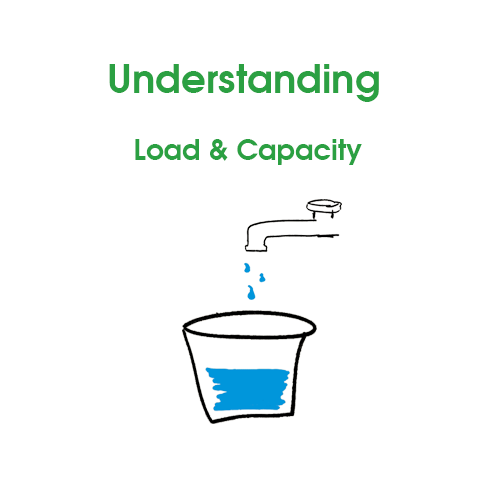 You’re putting more load (or water) into your disc bucket. More load/stress = more degeneration. There is no question that chiropractic adjustments give people relief. Chiropractic doctors wouldn’t exist otherwise. Same with acupuncture, physical therapy, medicine, massage, nutrition, + any other health intervention you can imagine. Still, we need to match each pathology, dysfunction, or problem with the gold-standard, sweet-spot solution for that problem. Only in doing so, can we fully address all issues contributing to pain + disease. I briefly explain this concept in a holistic (and effective) approach to chronic pain resolution. You can only hammer a nail when you’ve identified a nail as “a nail”. 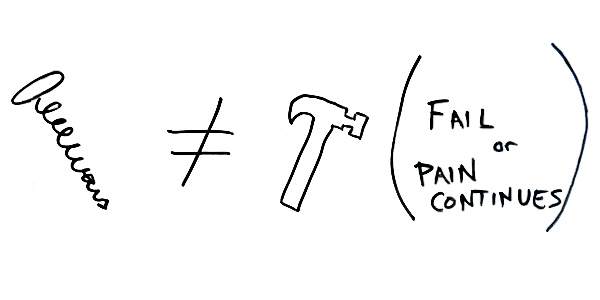 You cannot hammer a screw, like in the image above. You’d fail. My goal in writing this is education. You, the empowered patient, need to know that there are other paradigms of treatment that exist that could set you up for greater success than traditional chiropractic can. The majority of you can notice permanent, sustained improvement in your symptoms without further treatments in five treatments or less. You don’t have to accept my expert intuition, at least I shared it with you. If you weren’t aware, I’ll remind you, I am a chiropractor. I’ve already operated under the old paradigm. It wasn’t serving me or the patients I am privileged to serve. What should you do for your neck or low back tension or chronic pain? I’m 100% biased because our specialty at Barefoot Rehab is removing adhesion and we get paid well to do that. 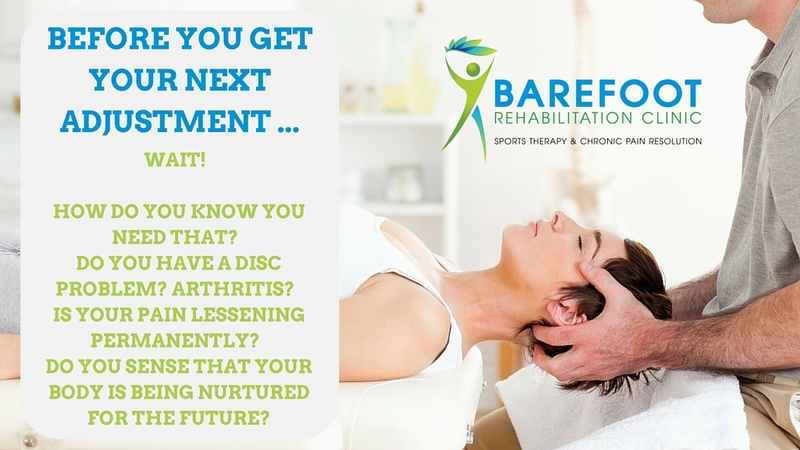 However, we have a large and ever-growing list of proof on our website, on the Barefoot Rehab facebook page, and google, from patients who didn’t realize our style of care existed and whose lives were better because they found our care. We have a nice handful of patients who had a diagnosis that did not include adhesion, who we couldn’t help, who respected that we told them the truth about their pain + referred them out as soon as we realized we couldn’t do a thing. Like my mom, who has severe enough degeneration that while treating her, I noticed large movement restriction without adhesion pulling tight. My 100% biased opinion for you to get out of pain as quickly and permanently as possible or to slow down the degeneration of your body is to see a qualified musculoskeletal specialist. Preferably someone who knows who to proficiently remove adhesion. Update 8/11/2017: If you sit a lot and have low back pain, we found this review of the Best Standing Desks on reviews.com. Pick the one that suits your situation and find relief. What has your experience been with chiropractic? I know there are those of you out there who swear by traditional chiropractors. I have nothing against that. I do have something against people in pain getting care that isn’t addressing the primary cause of the problem though. Better solutions exist. I am confused .I am in pain. I have had lower back surgery which left me with 4 fusions,2 -6″rods and 8 screws. I developed a problem with my neck and numbness in my hands and fingers.The back surgery was to eliminate a pinched sciatica nerve that caused numbness in my thigh. The surgery is another story and now I have a pinched sciatica nerve that radiates in my left calf ,ankle and 3 toes going numb and calf swelling. I have been going to a great chiropractor for 5 and one half months. The sciatica is worse and I ache all over and the only thing I can say is better is my S1 joint is not as painful a nd numb or burning . I am at a loss as to what to do as I really down deep feel the adjustments are making me have more pain. Do you have any suggestions as how to proceed ? I’m sorry for your confusion and pain. I know how much it can affect life and our happiness. First, it’s very possible that your surgery (and already degenerated spine) will have to live in pain. Once we accept this fact, then we can begin the emotional work to learn how to deal with it. But, hopefully there’s more you can do. I would stop the chiropractic adjustments. After 5.5 months, you should notice more progress than that. Where do you live? Can you find an Integrative Diagnosis doctor who knows how to remove the scar tissue from your surgery? Let me know. Here for you.